The Injil (Arabic إنجيل , also transcribed Injeel) is one of the four Scriptures that the Qur'an records as revealed by Allah—the others being the Zabur, Tawrat, and Qur'an. The word Injil is generally held by non-Muslim historians to be an abbreviation of the Greek word Ευαγγέλιον, sometimes rendered in English as evangel (and literally meaning "good news"). It is usually translated as Gospel, as in the four Gospels of the New Testament. The word Injil usually denotes the New Testament. Some Muslims believe the Gospel or the New Testament may have been corrupted over time. Conversely, Quranic scholars point to references in the Quran that imply that Allah would not allow his revelation (i.e. the Injil) to become corrupted. Finally, some also hold the view that the Injil is a lost book, different from the New Testament which was either written by the apostles or people connected to them rather than revealed word for word by God to the Prophet Jesus. Muslim suspicion that the four gospels are not reliable or authentic makes use of them problematic in Christian-Muslim discourse, although Muslims cite Bible passages such as Deuteronomy 18: 18 as predicting Muhammad as the prophet “like Moses.” A few Muslims, such as Ahmmed Deedat, not only regard the true Injil as lost and the Gospels as false, but go so far as to suggest that the Jesus of the Gospels is different from the Jesus of the Qur'an. While Muslims honor the latter, they can vilify the former, thus "when speaking of the Qur'anic Jesus he is respectful, when speaking of the Christian's Jesus he uses phrases such as 'Jesus had doubly miscalculated', the 'prank that Jesus was playing went too far' and 'Jesus had been most reluctant to die'. Far from remaining silent like a lamb being led to the slaughter, Jesus presented a 'masterful defense' before his accusers." The word Injil occurs twelve times in the Qur'an (III, 2, 43, 58; V, 50, 51, 70, 72, 110; VII, 156; IX, 112; XLVIII, 29; LVII, 27 ) and refers to the revelation transmitted by Isa. Injil is only used “for the Christian revelation” and all occurrences of the word are “in Medinan passages, with the exception of 7: 156/157, which is traditionally regarded as late Meccan.” The word also means the scripture possessed and read by the Christian contemporaries of Mohammed (V, 51; VII, 156), i.e., the four Gospels, often extended in current usage to mean the whole of the New Testament. The Qur’an refers to the message of Isa although the contents of this revelation are not detailed, since Muslims believe that all prophets receive the same essential message in terms of its universal aspects, even if some of the content addresses their particular historical situations. However, passages such as 3: 79, “be worshippers of Him who is the true Cherisher of all” and 43: 63-4 “God is my Lord and your Lord, so serve Him” and sum up Jesus’ message as one of obedience to and worship of the One God, not worship of Himself. At 5: 116 Jesus is challenged whether he had told people to worship himself and His mother, and he replies, “Never could I say what I have no right to say.” At 61: 6 Jesus’ predicts the coming of one called Ahmed, whom Muslims equate with Muhammad. Since Jesus’ message is found in the Injil, which it was his mission to preach, there is no need to repeat this in the Qur’an, as Parrinder says, “The teachings of Jesus are in the Gospel, and the Qur’an does not repeat them.” Such verses as the above make it clear that Jesus did not teach the “Trinity,” or ask people to worship Him, or claim to be God’s son. The Islamic view is that God, who is above all merciful, constantly sends prophets and apostles to humanity to remind them of God's "straight path" and of the distinction between permitted (halal) and prohibited (haram) conduct. Immediately after Adam disobeyed God, God forgave Adam and gave his "words of inspiration" (Q2: 37). These "words" are taken to refer to the first book, or Kitab, or scripture. Similarly, prophets such as Moses received a Book. Thus, the Injil is the Book that was revealed to Jesus. Each Book confirms what was revealed previously, so Jesus' Book "confirmed the Torah which was before it" (5: 46). As the final and complete revelation, the Qur'an "confirms that which went before it," specifically "the Law of Moses and the Gospel of Jesus" (Q3: 3). God needed to send fresh revelations because of humanity's rejection of earlier Books and prophets, and also because of the way in which people corrupted the sacred books. Muslim scholars generally dispute that Injil refers to either the entire New Testament or the four Gospels. Others believe the Injil was not a physical book but simply a set of teachings. The word Injil is used in the Qur'an, the Hadith, and early Muslim documents to refer specifically to the revelations made by God to Isa, and is used by both Muslims and some Arabic-speaking Christians today. 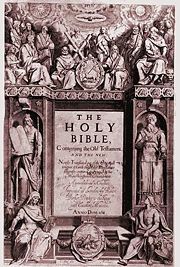 Title page of the original 1611 edition of the King James Version of the Bible. Some Muslims dispute the authenticity of the Gospels as well as of the Jewish Scriptures. The charge of tahrif has often occurred during Christian-Muslim discourse, when some Muslims have more or less dismissed the whole of the Bible as corrupt, notably Ibn Hazm. He wrote that the lies and inconsistencies found in Christian scripture was proof enough that “the Christian community is altogether vile.” Ibn Taymiyyah pointed out that the gospels resemble hadith more than scripture, since unlike the Qur’an they are not God’s direct speech, but consists of reports about Jesus as well as of his actual words. In comparison, Muhammad’s own words belong to the hadith. A writer such as M. Rahmatullah Kairanwi dismissed passage after passage as corrupt and started the trend to draw on critical New Testament scholarship to underscore that much of the content of the gospels back-projected the theology of the early Church onto the lips of Jesus. On the other hand, Syed Ahmed Khan argued in favor of the general reliability of the four gospels, and suggested that corruption or falsification may be one of interpretation, not of physically tampering with and altering the text. Khan did not equate the four gospels with the Injil received by Jesus but thought that they contain authentic elements of the injil. Christians, defending the integrity of the Gospels, point to the existence of thousands of ancient Manuscripts and to the verse that advises Muhammad to consult the people of the book "if in doubt about what he had revealed" (Q10: 49) which, they say, makes no sense if Christians and Jews possessed only a corrupt knowledge of scripture. ↑ Bennett, p. 174; see Ahmed Deedat, Crucifixion, or Cruci-fiction. Crucifixion, or Cruci-fiction Retrieved February 26, 2008. ↑ Parrinder, p. 142. Meccan passages date from the period 610 to 622, Madinan from 622 until Muhammad’s death in 632 C.E., according to the standard chronology. ↑ See detailed discussion in Bennett, pp 131-137 and Kairanwi, M. R, and Izhar-ul-Haq, The Truth Revealed (London: Ta Ha, 2003, ISBN 1842000462). ↑ The Gospel of Barnabas is available at The Gospel of Branabas, Retrieved February 26, 2008. The narrative of its origin ascribes it to Paul’s sometime companion. A copy is said to have sat in the Vatican until permission was given by Pope Sixtus (1589-90) for a translation to be made. It later appeared in a Spanish edition, reportedly rendered from an Italian version, to which George Sale referred in his Preliminary Discourse (1734), available online at Koran…with Preliminary Discourse, Retrieved February 26, 2008. Most non-Muslim scholars of this text regard it as a forgery from about the time it is said to have emerged from the secret archives of the Vatican. See John Gilchrist, “Origins and Sources of the Gospel of Barnabas” Origins and Sources of the Gospel of Barnabas, Retrieved February 26, 2008. This page was last modified on 3 March 2018, at 17:56.